It has recently emerged the concept of “obesity paradox,” a term used to describe the unexpected improved prognosis and lower mortality rates found in several diseases in patients with higher body weight. Concerning stroke, few clinical studies have assessed this obesity paradox showing contradictory results. Therefore, our aim was to compare clinical evolution and inflammatory balance of obese and non-obese patients after ischemic stroke. We designed a prospective case-control study in patients with acute ischemic stroke categorized into obese (body mass index, BMI ≥ 30 kg/m2) and non-obese (BMI < 30 kg/m2). We compared clinical, anthropometric, radiological, and laboratory variables. The main outcome variable was the functional outcome at 3 months. We included 98 patients (48 non-obese and 50 obese). No differences in functional outcome at 3 months were found (p = 0.882) although a tendency of a greater recovery on neurological impairments was seen in obese subjects. Importantly, obese patients (p = 0.007) and patients who experienced poor outcome (p = 0.006) exhibited a higher reduction in body weight at 3 months after stroke. Moreover, pro-inflammatory IL-6 levels (p = 0.002) were higher in the obese group. However, IL-6 levels decreased over the first week in obese while increased in non-obese. On the contrary, levels of the anti-inflammatory IL-10 rose over the first week in obese patients, whereas remained stable in non-obese. In summary, despite exhibiting several factors associated with poor outcome, obese patients do not evolve worse than non-obese after ischemic stroke. 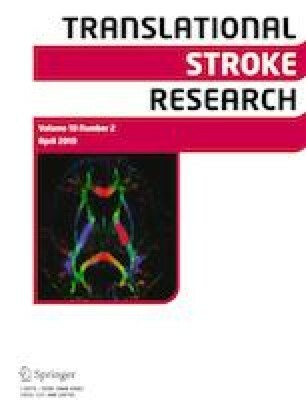 Obesity may counterbalance the inflammatory reaction through an anti-inflammatory stream enhanced in the first moments of stroke. The online version of this article ( https://doi.org/10.1007/s12975-019-00695-x) contains supplementary material, which is available to authorized users. This project was partially supported by grants from the Spanish Ministry of Economy and Competitiveness (SAF2014-56336-R, SAF2015-71026-R and SAF2017-84267-R), Xunta de Galicia (Consellería Educación: GRC2014/027, 2016-PG068 and IN607A2018/3), Instituto de Salud Carlos III (Proyecto de Excelencia dentro de los Institutos de Investigación Sanitaria (PIE13/00024) and PI17/01103), Spanish Research Network on Cerebrovascular Diseases RETICS-INVICTUS PLUS (RD16/0019), and by the European Union FEDER program. Furthermore, T. Sobrino (CPII17/00027) and F. Campos (CP14/00154) are recipients of research contracts from the Miguel Servet Program of Instituto de Salud Carlos III. The sponsors did not participate in study design, collection, analysis, or interpretation of the data, in writing the report, or in the decision to submit the paper for publication. This research was carried out in accordance with the Declaration of Helsinki of the World Medical Association (2008) and approved by the Ethics Committee of the Servizo Galego de Saúde. Informed consent was obtained from all individual participants included in the study. If patients were not able to sign, relatives gave signed informed consent.